This article brings you the CBSE Class 9 Science chapter, Tissues: Important topics & questions to prepare for CBSE Class 9 Science Examination, 2017-2018. Every important topic from chapter, Tissues, has been covered in this article along with important questions pertaining to those topics so as to help you get a better understanding of the concepts and fundamentals. 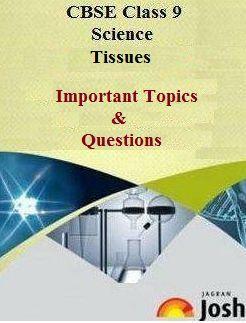 Get the CBSE Class 9th Science chapter, Tissues: Important topics & questions to prepare for CBSE Class 9 Science Examination, 2017-2018. This will provide you with a very clear idea about what type of questions are being framed for the exam and from which topics. The pattern in which the question paper is set is quite different from the style in which the course structure is actually defined. Consider the below mentioned terms/questions at the time of preparation. • Definition of tissue and examples. • Difference between animal and plant tissue. • Utility of tissues in multi-cellular organisms. • Describe the term meristematic tissue. • What are the functions of cuticle and stomata? • What is the differentiation? Like plant tissue there are different types of tissues found in animals. Given are the following tissues. Define the following terms and mention the places where they are found. Q. Basis of classification of animal tissue? Q. Name the Parenchyma with chlorophyll which performs photosynthesis? Q. Distinguish between ligament and tendon? Q. Write short notes on Cardiac muscles? Q. What is the role of epidermis in plants? Q. How does the cork acts as a protective tissue? Q. Which tissue protects the entire body? Q. What is a synapse? Q. What will happen if apical meristem is damaged?